What has two thumbs and is black and white + red all over? You're observing my last days as a red-head. By the time you read this, I will have returned to my regular role as a lovable brunette. The red is a bit too much maintenance for my taste, but I sure enjoyed the fire-engine tresses while I had 'em! I really like how my colored hair made every outfit look like a fashion statement. Case in point- this super casual T-shirt layered over my rayon polka dot romper/onesie. Big, baggy and comfy, the outfit gets a boost from the bright mop top. I'm really enjoying my new high-low hemmed, aka "mullet" top, an Aztec printed polyester top from Sugarlips. It does all right for comfy and casual and I'm imagining all sorts of summery outfits featuring this "wild high-low", some studded sandals and cut-off jeans. Although in my new landscape, those cut-offs will probably come paired with tights and a sweater. I'm sort of wishing for a heat wave right about now. The top in tribal polyester can be purchased HERE. Next week, I'll be off on little adventure- and I can't wait to share my experience with you! I do have some great posts scheduled, but I won't be able to visit your blogs. I will be posting some sneak peeks on Instagram/Extragram and Twitter, so be sure you're following if you want a preview of the fun. Brooklyn Industries: Mega Sale at Brooklyn Industries - Up to 70% off Women's, Men's, and Bags. ROMWE: Spend $50 and get 15% off and free shipping over at ROMWE, offer ends July 20th. Coupon Code: 15%July. French Cuff Consignment: Shop designer consignment and get 20% off with coupon code: ROSEBUD. And don't forget to shop my ETSY shop! Use coupon code BUDZFREESHIP to get free shipping in the U.S. I loved your red hair too! But I get the maintenance thing. Enjoy the adventure! You will be fabulous in any colour, my gorgeous. I have just seen the photo of you with Ari, ahhhhhhhhhhhhhhhh. I'm with Sacramento - fabulous whatever the colour or style and I'm looking forward to seeing photos of the next incarnation. Enjoy your adventure; it sounds intriguing. You look great whatever colour your hair is! Fabulous print mixing again, of course. Teasing us with an adventure . . . can't wait to see. Goodbye red hair, you look fabulous in any color hair, Bella! I will miss your red hair, but I completely understand about needing low maintenance ....you are just as fiery and colorful as a brunette!! This is such a cute look to pay a fond farewell to RED with!! love so much the mixture of patterns!! amazing top and shoes!! Beautiful top! But as you've mentioned that its fabric is polyester then is it comfortable for this hot season? Suggest any better option, please. Good day Bella :). 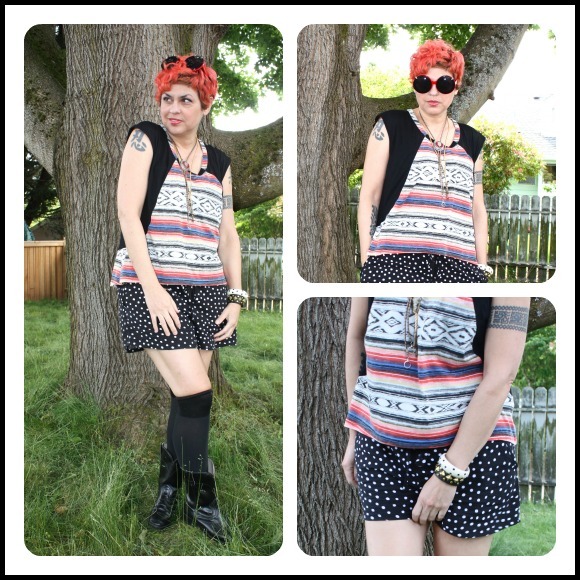 A great inspiration for my high temperature weekend!The aztec top is great on the polkadots shorts and the knee high socks and boots are a perfect combination: another masterpiece of clashing lengths and patterns!! I love that about bright red hair too, but you're right, it can be a pain to maintain. You'll be just as gorgeous as your usual brunette! I really like this outfit - relaxed & casual without looking sloppy. you're right, red hair is too much maintenance! and you're a lovely brunette too! And love your aztec+polka dots outfit and fabulous sunnies! You are so mysterious. Cant wait to see where you are headed. WE just got back from Sac and it was fun but way too short. I got in 2 good days of thrifting between the baby shower and all that hoopla. Back to brunette? I can handle that. You are stunning either way. Thanks for all your votes. I lost, but I tried. It was intense. I'm with everyone else on this - YOU make each outfit the style statement, not your hair. I enjoyed that audacious red but any colour on you will POP! I love this outfit, the polka dots and stripes, especially with those thigh-highs. I look forward to hearing about your adventure...! So swashbuckling. And a perfect mix of padderns again! You look great. I am anxious to see your brunette hair, though! I have the tiniest wisps of gray beginning to show themselves. My thought has been, "Should I, or shouldn't I?" :) By the way, thanks for adding me to the over 40 fashion blogroll! I agree with YOU making the outfit, but I do know that our hair has to feel like it belongs on our head. You'd probably have a hard time doing something mainstream. I also need to be entertained and enjoy my own hair and lately have been thinking about white or platinum. I think it's striking on women. Sure have enjoyed your red, but if I recall, brunette was fabulous too. 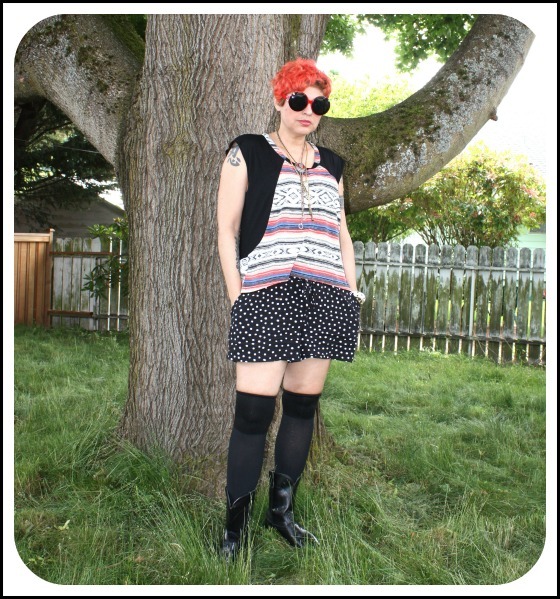 Happy to see your polka dots back and love how you make boots look great for summer! You are the reina of patterns and textures amor!That Aztect top is stunningly gorgeous. I love you in any color ,I been wanting to get a white skunk streak ,but I'm lazy with the whole dying it constantly.Hope you had lots of fun corazon. That pattern combo is fantastic! You look fab-u-lous! I have an abiding fondness for aztec prints ... loved them since the '80s! I really like how you paired them with the black & white neutrals. I really have to get something in a tribal print. Sactownies: Get Ready to LAUNCH!